day one hundred thirty seven. As someone who enjoys drawing as a hobby but isn’t a professional who depends on my scribbles for sustenance, there are worse problems to have than the one I’m having right now. I’ve been drawing journal comics in one form or another for the past seven years and I’ve never hit a wall the way I have this past week. 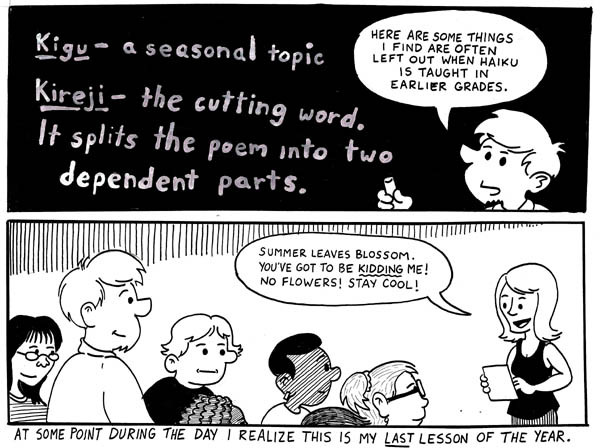 I only have TWO comics left to draw to close out the 2009/2010 school year, man! 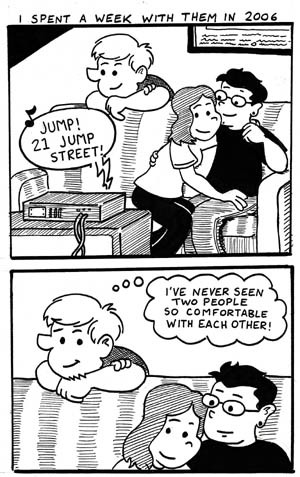 Two more comics, and I just CAN’T. Get ’em done! …so lemme say this: I will get them done. I will get them done this week. I promise. 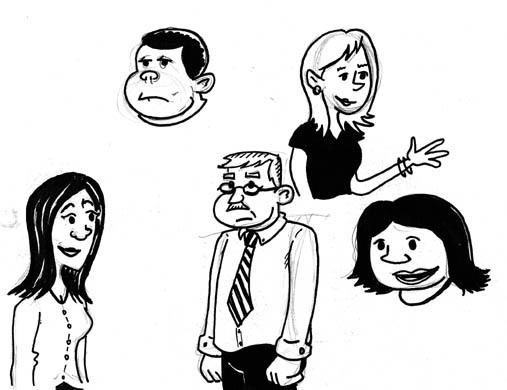 In the meantime, here’s a couple of sketchbook drawings, done when I was still considering including other teachers in the strip. 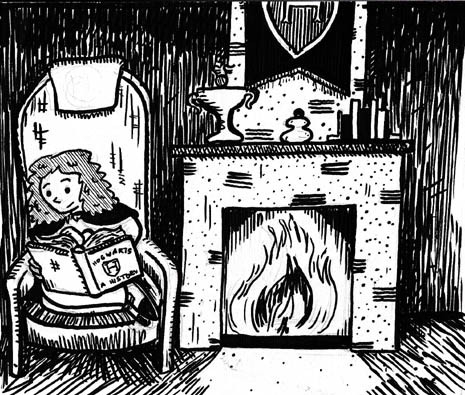 I also found this Harry Potter drawing I really liked. I don’t get to do a lot of shading in the daily strip, so occasionally it’s fun to sketch something like this. If memory serves, I was using some kind of weird Japanese pen on this drawing. Saying that essentially frees me from anything resembling authority on the topics I’m writing about… and therein, any responsibility to be knowledgeable about the latest comic strip collection I’ve happened across. It’s a cop out, yes. I will own up to that completely. It’s also the thing that allows me to even begin to think I have anything to say about these books, most of whom (even if I make with the fun) are created by incredibly talented artists and writers. Well OK, 101 Shark Jokes excluded. Even with the above proviso, I now find myself somewhat stumped in writing about today’s Thrift Store Find, as it was written and drawn by someone who is inarguably one of the finest and most groundbreaking artists comics have ever seen. This guy literally wrote the book on how to make comics. 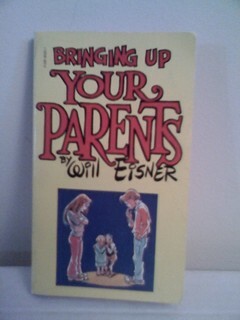 He’s revered in a way that is entirely befitting his tremendous talent… and now I find myself sitting here and trying to think of something to say about Bringing Up Your Parents by Will Eisner. As you may have noticed, there haven’t been any new comics this week. I could give you a ton of excuses, but I realized the true reason I stopped comic-ing this week: I only have TWO comics left to draw about this past school year! One of ’em will be up on Monday to finish out last week’s batch, and then I have another “one comic covers a full week” strip similar to the comic I drew here back in February. That’s pretty much all she wrote for the 2009-2010 school year, and I think that sort of froze me up a bit. I don’t often have insight like this into my creative process (as cheesy as it sounds); most of the time, I’m just plodding away blindly. As I mentioned a few weeks ago, I feel I learned a lot about the things that work and the things that don’t work about this comic, and I’m anxious to get started on next year… one that I think you’ll see, is a crucial one for both my career AND my school in general. I got sunburn this week. First sunburn of the summer, and with my pasty complexion, it’s sure not to be the last sunburn. I couldn’t sleep last night, so I stayed up late reading my new book, The Passage by Justin Cronin. I usually wait until I am done reading a book before I give it a recommendation, but it’s a real page-turner in the vein of early Stephen King. Heck, I think The Passage owes quite a bit to King, especially his post-apocalyptic masterwork The Stand, and I say that as a compliment. I won’t give away too much more than that, except to say that Cronin does something absolutely genius in the first third of the book by setting the time directly before the world ends in a distant future America where a tank of gas is $200 dollars and New Orleans exists only as a toxic waste dump. By taking the problems of today and ratcheting them up to a not-entirely insane degree, Cronin creates this great “out of place” feel for readers that just gets more and more eerie as the story goes on. That bein’ said, the first third of the book is a preamble for the rest of the story, dealing with the literal and figurative fallout of what happens in the beginning, and I’m only now getting into that section. If you’re looking for a great summer read, look no further. As I think I’ve mentioned before, I don’t watch a whole lot of television. You could say that I am in the presence of television quite often, as I normally lie on the floor and draw while Ellen watches stuff… or we both watch things together, and I pay half of my attention toward. 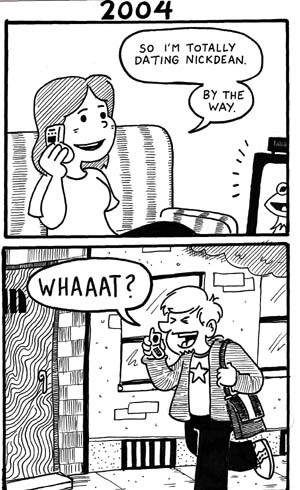 I’ll listen to a TV show, almost like a radio play, as I’m drawing comics. This is how I’m able to know what’s going on with ABC’s The Bachelorette without being able to pick any of the contestants out in a line-up. There are some shows that I’ll put away the pen and Bristol board for, however. Summer for Ellen and I has become synonymous with “cooking reality shows” and Ellen and I were both pumped for the return of Bravo’s Top Chef and the lesser but still enjoyable The Next Food Network Star (from The Food Network, natch). Weirdly enough, we’ve also really gotten into this other show on Bravo, Work of Art: The Next Great Artist. It’s a premise that’s absolute baloney, taking 12 aspiring artists and having them compete in challenges akin to those on Project Runway. I don’t think anyone expects “great art” to arise out of this hoary premise, but it’s been fun to watch in the past few weeks. These are the second half of the mini-comic I posted here yesterday. During college, my friends and I were big fans of the 1984 film adaptation of The Outsiders. Directed by Francis Ford Coppola, there are some seriously strange edits throughout that movie that made it fun to obsess over. Lori also had a weird dance she would do whenever we played the Billy Joel song “Pressure”. 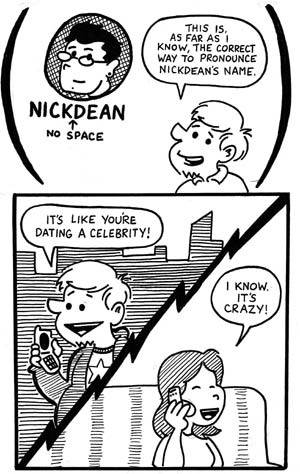 I think the first panel is self-explanatory, but the second needs a little clarification. 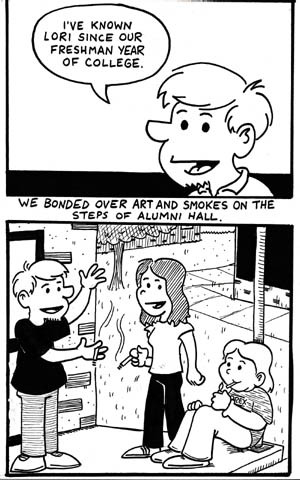 When we were all in college, I was a cartoonist for Fredonia’s newspaper. 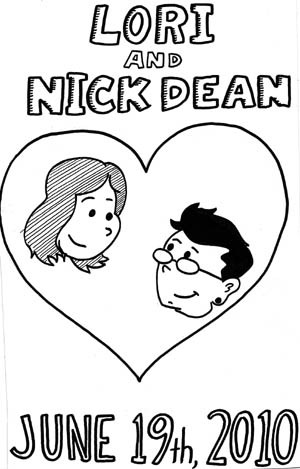 Nick was a staff reporter for the paper and also contributed a one-panel comic that only occasionally veered into the realm of “making sense”. 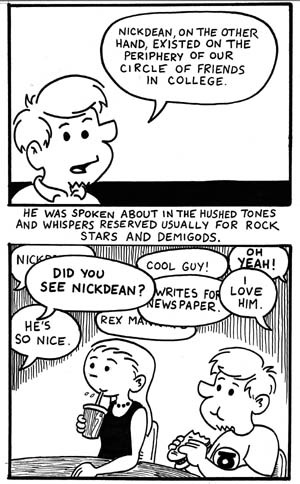 My impression was always that the comic page editor asked Nick to do something to fill those pages, which were always a little anemic. I knew I had to include a crossover panel in this comic. I am sure there were at least eight people who read this who were thrilled. …and that’s that. I know this was probably pushing the limits of what people visit here for, as it has very little to do with teaching or my classroom… but I enjoyed drawing this little comic, so I was glad to share it! 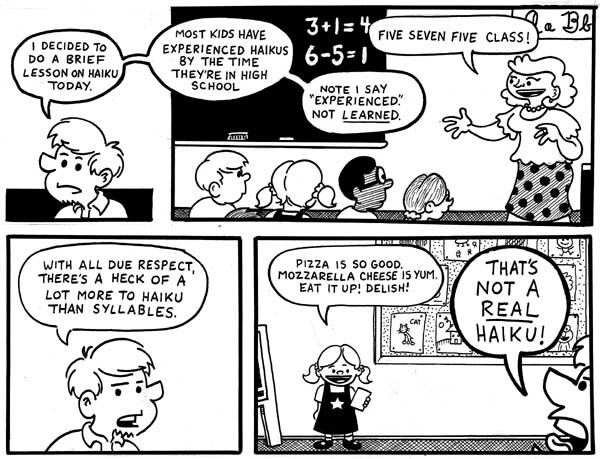 You’ll all have to wait an extra day to hear more about haikus. The family and I just got back from Western New York, where we went to the wedding of one of my friends from college. 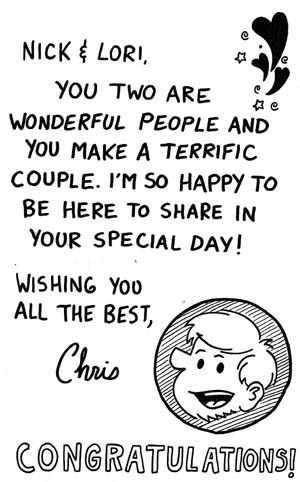 I decided to draw them an eight page mini-comic as a wedding present. I thought I’d post ’em up here over today and tomorrow. 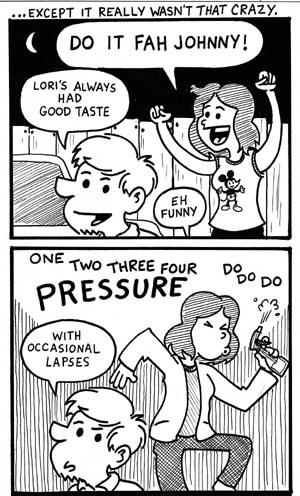 They didn’t scan the best, but these comics were really fun to draw. It made me realize I’ve been drawing a LOT of desks and lockers over the past ten months. More tomorrow! (Thrift Store Finds is a mostly-weekly “column” of sorts where I discuss some of the cool books I’ve happened upon in my neighborhood’s St. Vincent DePaul store. Please don’t mistake me for an expert on any of the things I am writing about… I’m just a fan of a bargain. Buying actual comic books at a thrift store is kind of a crapshoot… the emphasis on “crap”. In the past twenty years, most non-geeks have become clued into the fact that comics can be worth money on the secondary market. Every once and awhile you’ll see a story on The Today Show where a rich insane person payed a cool $1 million dollars for the first appearance of Superman, and that kind of thing sticks in the mind of a normal person. The upshot of this fact is that MANY people think that because Action Comics #1 is worth a fortune, that ALL comic books are worth a fortune. I mention this because over the past few years, I’ve pawed though my fair share of Babylon 5 comic books from the mid 1990’s marked up to $15 dollars apiece, despite most comic book retailers not being able to give Babylon 5 comics. Secondly, most comics that make their way to a thrift store are, in my experience, pretty uninteresting to me as a comics reader. 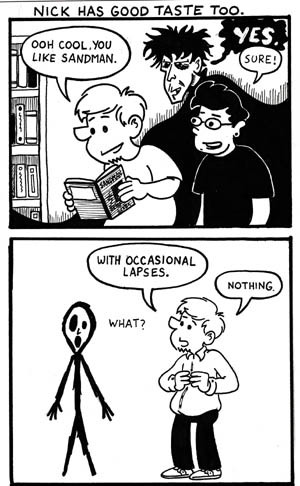 I’m more interested in newspaper comic strips than anything else, and although I have some plain ol’ comics that I’m reading right now, I’m not actively looking to expand my collection. Finally, thrift store comics are usually in horrible condition. Even if I did manage to find a comic I was both interested in AND was worth something on the secondary market, the chances are that by the time I found it, it would look like something the cat dragged in. At any rate, luck was on my side this past week as I walked into our St. Vincent De Paul store and found a sizable stack of comics on the front counter with a sign on them that said they were $1 dollar each. Condition wise, most of them looked like they had just come off the rack, rather than festering in a thrift store back room. Having sufficiently caught my eye with price and presentation, I started browsing and found some real gems. 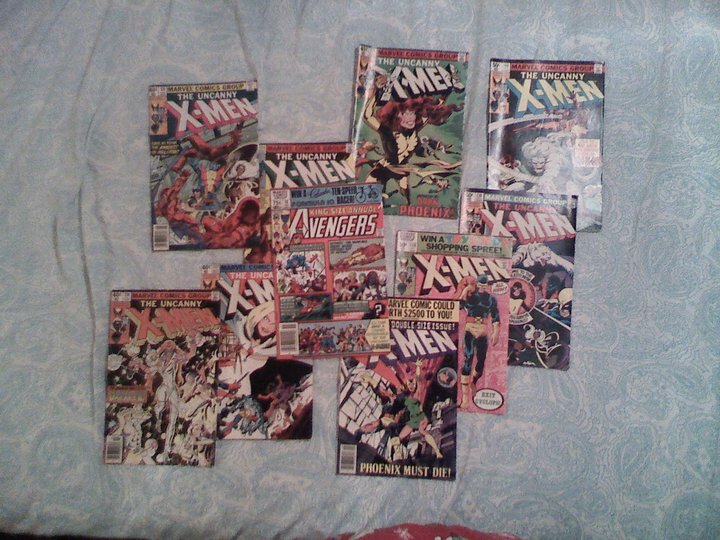 What you see here are an assemblage of early issues of the “new” Uncanny X-Men, written by Chris Claremont and drawn by John Byrne. While the X-Men comic book had already run for a couple of years, these are the issues that defined what it is most people think of when they hear the name The X-Men. The issues I found include #129 through #131, #134, #135, and issues #137 through #140. Although there are significant gaps, one of the big X-Men stories, The Dark Phoenix Saga, is represented pretty well in these comics. For you normals, The Dark Phoenix Saga is a storyline from the comic books that was strip-mined for the big X-Men movies that came out a few years ago. This story was pretty darn revolutionary at the time it was published and I say that as not even that much of an X-Men fan. You’ve also got some “first appearances” in these comics, including the titular Dark Phoenix herself along with X-Men baddie The White Queen and the young X-Man (or X-Woman, I guess) Kitty Pryde. Oh, and also the disco queen superhero The Dazzler. All of these characters went on to play big roles in the X-Men comics throughout the 1980’s up through today. I was surprised to find these sitting in a secondhand shop. Counter to another thrift store/comic convention, these books are in pretty great condition. X-Men #131 has a creased corner; ditto #135… but for the most part, like I said, they look terrific. I paid a buck apiece for these, $9 dollars total. Conservatively, if I were to hock ’em on eBay, I could probably get anywhere between $50 and $75 dollars for the lot. I believe the market has somewhat fallen out of collecting individual issues these days, as comic companies get more clued in to the ins and outs of traditional publishing… but there’s always someone out there who wants to own the original printing, no matter what the cost or condition. These were good finds. …but wait, that’s not all! I also found a comic book I have, no joke, been looking for for YEARS. That would be The Avengers Annual #10, pictured dead center. Along with some spectacular Michael Golden artwork, this comic features the first appearance of Rogue! I know, you’re saying to yourself, “Who the heck is Rogue again?” Rogue is the X-Man (or X-Woman, again) who can rob you of your superpowers simply by touching you. Not ringing a bell? Rogue is the character played by Anna Paquin in the X-Men movies. You with me? Great. No lie, I have been looking for a copy of this book since 1992, when I was first getting into comics. I read in a magazine somewhere that this was a big “under the radar” comic that was going to be worth a lot of money someday because of that big First Appearance. Although I’ve never been much of a collector, I really wanted to own a copy. It’s worth like $30 bucks now. Truth be told, I don’t care very much about the X-Men. I’ve always been more of a DC Comics fan… but all in all, this was a good day at the thrift store. You are currently browsing the Teachable Moments blog archives for June, 2010.